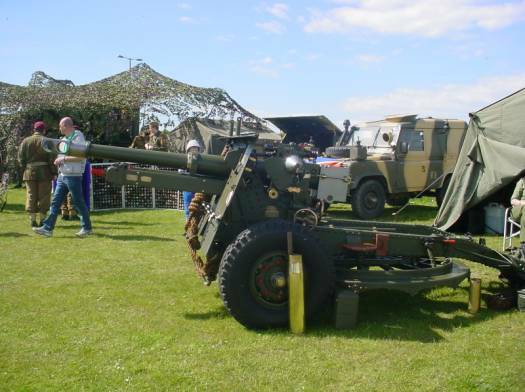 The Ordnance QF (Quick Firing) 25 pounder, or 25-pdr, went into service just before World War II, during which it served as the major British field gun/howitzer. 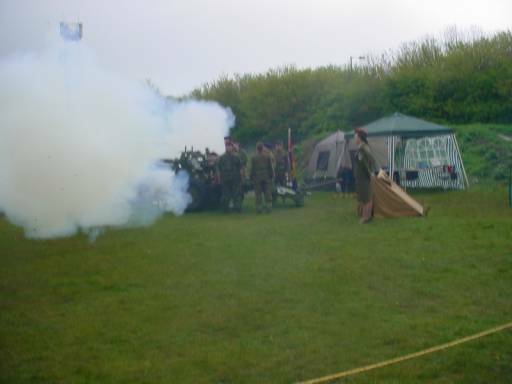 Combining high rates of fire with a reasonably lethal shell in a highly mobile piece, it was the British Army's primary artillery field piece well into the 1960s, with smaller numbers serving in training units until the 1980s. Many Commonwealth of Nations countries used theirs in active or reserve service until about the 1970s and ammunition for the weapon is currently being produced by Pakistan Ordnance Factories. The 25 pounder's main ammunition was the High Explosive (HE) streamlined shell. It was also provided with base ejection smoke (white and coloured), star shells, and chemical shells. The UK did not develop a WP smoke shell for the 25 pounder. For anti-tank use, the 25 pdr was also supplied with a limited amount of 20 pounds (9.1 kg) solid armour-piercing (AP) shot, later replaced with a more potent version with a ballistic cap (APBC). The AP shot was fired with maximum charge, Charge No. 3, Super, or Super with Super Increment depending on the ordnance mark, as muzzle velocity was critical in direct fire for penetration and a flat trajectory. The 25 pounder was the main field artillery weapon used by British Commonwealth and colonial infantry and armoured divisions of all types during the Second World War. Throughout the war each British-pattern infantry division was established with seventy-two 25 pounders, in three field artillery regiments. Armoured divisions eventually were standardised with two field artillery regiments, one of which was self-propelled. 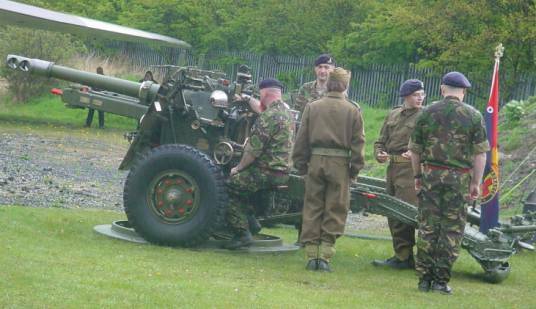 Before mid-1940 each regiment had two batteries of twelve guns; after that date regiments changed to batteries of 8 guns and added a third battery, a procees that was not completed until early 1943. In the late 1950s, the British Army reverted to batteries of six guns. Field artillery regiments had two batteries of 25 pounders and one of 5.5 inch guns. The early 25 pdrs had been towed in the field by the Light Dragon, a tracked vehicle derived from a light tank, and the Morris CDSW. Throughout most of the Second World War the 25 pounder was normally towed, with its limber, behind a 4x4 Field Artillery Tractor called a "Quad". These were manufactured by Morris, Guy and Karrier in England, and, in greater numbers, by Ford and Chevrolet in Canada. In the 1950s, the British Army replaced the various "Quads" with a new Bedford 3-ton truck, fitted with a special purpose body. In UK service most guns were replaced by the 105mm Abbot and the remainder by the 105mm L118 Light Gun. 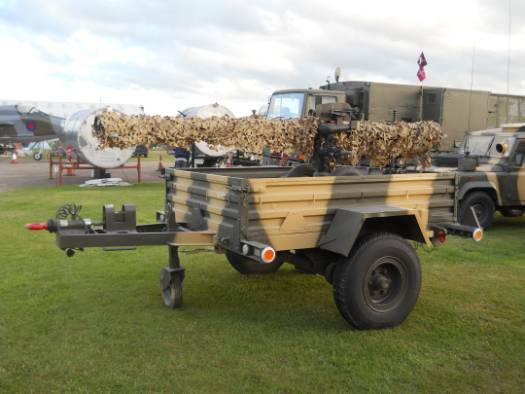 The last British military unit to fire the 25 pounder in its field role (as opposed to in a ceremonial role) was the Gun Troop of the Honourable Artillery Company on Salisbury Plain in 1992. In addition to Commonwealth and colonial forces other Second World War users included the free forces of France, Greece, Poland, Czechoslovakia, Netherlands, Belgium and Luxembourg. The first shot fired by US artillery against the German army in World War II was fired by a 25pdr of the 34th Infantry division. After the Second World War 25 pounder remained in service with many Commonwealth armies into the 1960s. It was used in Korea by British, Canadian and New Zealand regiments and in Malaya by British and Australian batteries. It also featured in wars on the Indian sub-continent and in the service of Israeli and other Middle Eastern armies. Since leaving UK service, the last users of the 25-pounder in combat have been the Special Air Service advisors to the Omani Army during the 1972 Battle of Mirbat in Oman, the Cypriot National Guard during the 1974 Turkish invasion of Cyprus and by Kurdish militias in northern Iraq in 2003. The BAT is a recoilless rifle of UK origin. 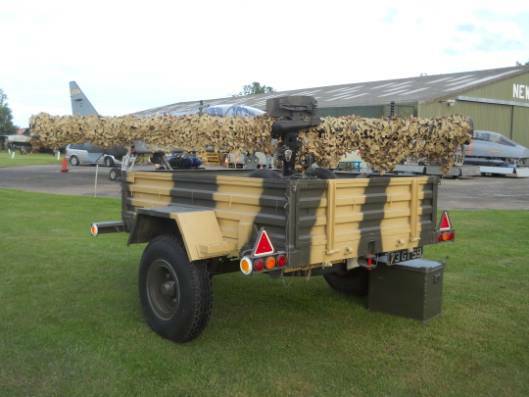 The BAT was developed in the early 1950's as one of the primary anti-tank weapons for the UK armed forces. The name BAT stands for Battalion Anti Tank. The BAT was the largest calibre recoilless rifle ever put in production. It proved to be a powerful weapon with various drawbacks, including a very limited mobility and enormous back blast. Eventually the BAT was replaced by guided anti-tank missiles that proved to be more mobile, powerful and had a longer range. The design of the BAT is based on the 3.45 inch RCL which was developed during World War 2 but never put into production. The BAT is a 120mm smoothbore recoilless rifle with a breech that slides downwards for reloading. A fixed towing ring is fitted at the muzzle. The ammunition is of the separate loading type and only HESH rounds are available. The original BAT has a large two wheel chassis and features a full metal gun shield to protect the crew. The MOBAT is similar but lacks the gun shield and adds a ranging machine gun. The WOMBAT is the latest version with a much reduced weight and a breech that swings to the side. The BAT fires 120mm rounds unique to this weapon. The only available type of ammunition that was developed was the HESH round, (High Explosive Squash Head), which is useful against both armoured vehicles and infantry positions. The effective range of the BAT is 800 meters with the maximum range being 1.600 meters. Due to the addition of spotting rifles on the later models the first round hit probability was improved significantly. The penetration is around 400mm of armour and the maximum rate of fire is only 4 rounds per minute. All versions of the BAT share the same barrel design and ammunition and therefore have a similar firepower. The original BAT was very heavy and could only be towed by truck. The MOBAT is much lighter and can be towed by the Austin Champ, Land Rover or any other light utility vehicle. The MOBAT can also be moved by infantry over very short distances. The WOMBAT is much lighter but still needs to be moved by vehicle. As the WOMBAT cannot be towed by a vehicle it must be carried on the vehicle. Often the WOMBAT was fired from the vehicle, allowing it to relocate quickly. The L4 MOBAT is a version of the original L1 BAT without shield. The name MOBAT stands for Mobile BAT. Since the shield is removed it is much lighter, has a smaller silhouette and is able to traverse over 360 degrees. The two wheel chassis is retained and due to the reduced weight it can be towed by a Land Rover. To increase first round accuracy a 7.62mm Bren ranging machine gun is added to the left of the weapon. A L4 MOBAT retrofitted with a 12.7mm ranging machine gun is known as the L7 CONBAT, with CONBAT meaning converted BAT. The BAT fires only a single type of ammunition, the 120mm L2 HESH round. The HESH round is effective against both armoured vehicles, enemy positions and infantry. The ammunition is of the seperate loading type with the first part being the shell and the second part the metal casing with propellant. It is reported that smoke, illumination and training rounds were developed but only used in very limited quantities. 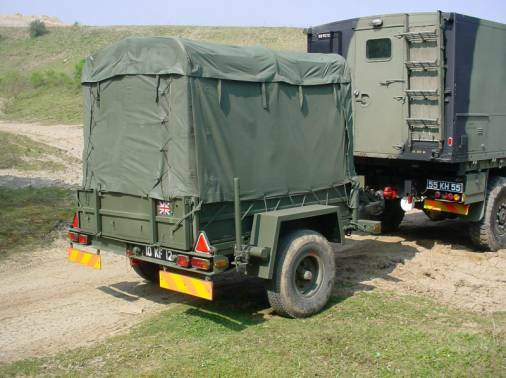 The FV2408 Mk1 Reynolds Boughton 1.75 tonne trailer, is a basically the same as the Mk2 Arrows with the braking system being the major difference. Hydraulic overrun brakes (with an onboard master cylinder) have replaced the earlier mechanical braking system. The lighting system has also been updated, with a pair of smaller running lights on each side at the front of the trailer, replacing the single "bug eye" Lucas lights, and the rear individual "bug eye" lights being replaced by composite light clusters. The Cooking Outfit No. 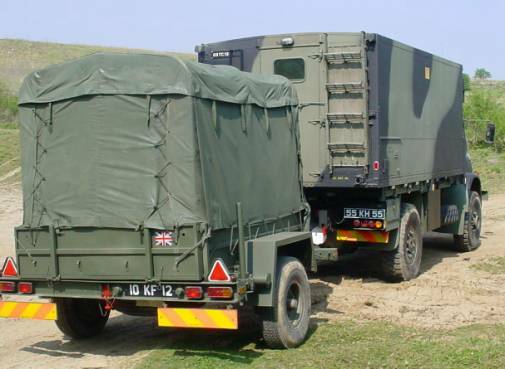 4 Mk 2 is designed to provide a mobile kitchen facility is capable of producing meals for up to 150 personnel using fresh or composite rations, or an emergency meal of stew and tea for up to 258 personnel.Sufficient Equipment is provisioned to enable baking, roasting, frying and boiling operations to be undertaken simultaneously. The Cooking Outfit is mounted on a 3/4 tonne wide body, two wheeled trailer chassis, with a special Cooking Outfit body, canopy and frame. The heating equipment consists of eight Mk 2 Remote Burner Units. Each remote burner unit has a maximum heat output of 14.5kW (50, 000 BTU). Two burner units are mounted at the front of the Cooking Outfit which can be utilised for the ovens. Four are mounted at the rear of the Cooking Outfit. The remaining two, which are supplied as spare or back-up units for use off of the Cooking Outfit, are carried on a frame. The two oven burners and the four rear burner units have isolating valves, one between each burner fuel pipe connection, four in total. There are two trailer mounted stainless steel food preparation surfaces. One is situated over the drawbar and swings down in front of the ovens. 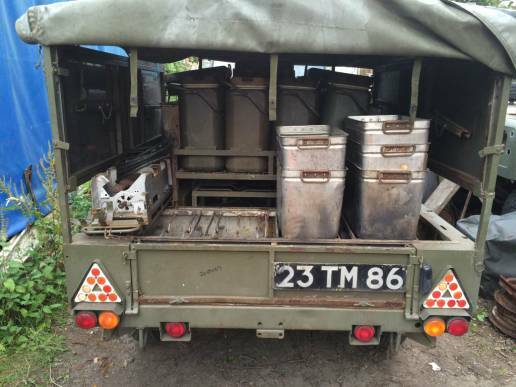 The other is carried on the body of the Cooking Outfit and can be fitted on either side of the trailer body. Two ovens are mounted at the front of the Cooking Outfit. They are of an air-jacketed construction to reduce weight and heat loss and are manufactured from stainless steel sheet. A rack is provided at the top of each oven which can be used as a hot plate to utilise waste heat. Each oven has three wire shelves adjustable to different positions. The main cooking pot is a 27 ltr (6 gall) rectangle stainless steel container with splash plate and lid. The baking and roasting pan is of heavy-duty aluminium with lid. The pan body can be used for deep-frying and the lid for shallow frying. It can also be used for pot-roasting, steaming and keeping food warm. The insulated food container is manufactured from double skinned heavy-duty polythene with an insulating filler of polyurethane foam. It weighs 5.6 kg and has a high thermal efficiency, can be used for insulator cooking and has a capacity of 18 ltr. A tap and vacuum release valve is fitted into the lid. 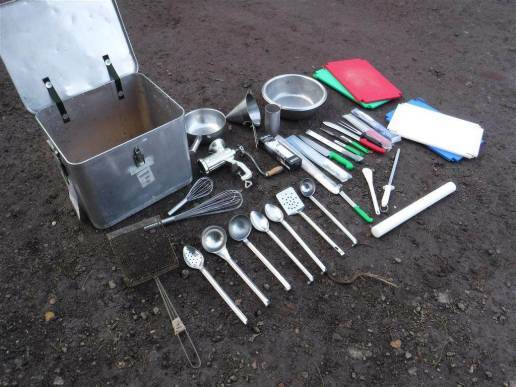 A comprehensive selection of kitchen tools is supplied and these are carried in the kitchen box. 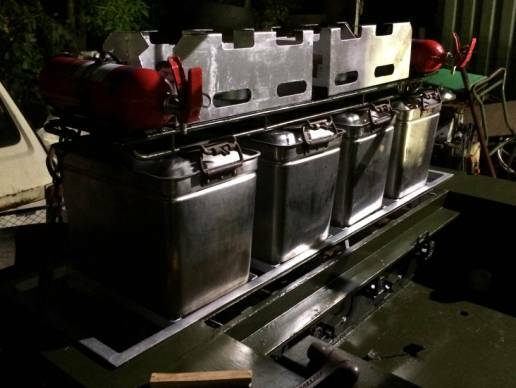 The Frame stand remote heater is used in conjunction with the spare Mk 2 remote burner unit and 27 ltr containers to provide a freestanding water heating / cooking facility.